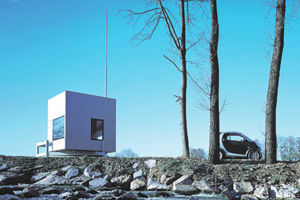 The Micro Compact Home (mc-h) is designed as an ultra-compact dwelling that is prefabricated and can be delivered and installed at any location. The design draws inspiration from the design characteristics of live-aboard yachts. A team of researchers and designers based in London and at the Technical University in Munich developed the m-ch as an answer to an increasing demand for short stay living for students, business people, sports and leisure use and for weekenders. 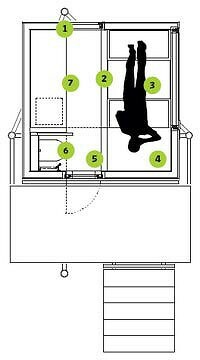 The m-ch, now in use and available throughout Europe, combines techniques for high quality compact 'living' spaces deployed in aircraft, yachts, cars, and micro apartments. Its design has been informed by the classic scale and order of a Japanese tea-house, combined with advanced concepts and technologies. Living in an m-ch means focusing on the essential - less is more. The use of progressive materials complements the sleek design. Quality of design, touch and use are the key objectives for the micro compact home team....for 'short stay smart living'. The Micro Compact Home designed by Richard Horden sets a new benchmark for compact living. This page was last modified 12:47, 3 September 2010.